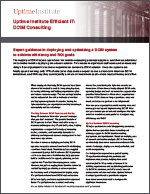 Abstract - The majority of DCIM buyers spend over six months evaluating potential suppliers, and then an additional six to twelve months deploying the chosen solution. This results in significant staff costs and unnecessary delays if an organization’s business requirements demand a DCIM solution. Once the systems are finally up and running, only 17% of enterprise data centers expect to see a short-term return on DCIM investment, and 49% say they cannot justify a return on investment at all—more wasted money and effort.